20 Crew games ago, Columbus lost to Seattle 6-2 in a game that seemingly sent both franchises in different directions. Since that faithful August 27th embarrassment, the Crew Franchise has entered into modern era (Designated Player Era 2007-Present) lows in Points Per Game and Goals Per Game. Last night however, Columbus went back to the place that caused them to tailspin and came out with a hard fought 2-0 Win. Columbus won the MLS Reserve League last year and the core group from that team has helped turn this 2012 season around on the Senior team level. They've done it in the toughest way possible, too. On the road out West, during late game start time slots. The formula to success in this league doesn't appear to be as complicated as many think. It isn't flashy signings (Milovan Mirosevic and Olman Vargas) or 1st round draft picks (Ethan Finlay) that bring the wins. It's good old fashioned chemistry through hours and hours of working together as a team. The Crew have been pretty good since this group has peppered the starting line up. A couple wins, couple draws and a loss. Take a look at the play betwixt this group of guys when you get a chance. There's confidence. Passes are made almost without thought (especially noticeable with Williams and Gruenebaum). Until last night's 2-0 win over Seattle, The Crew were only averaging 0.95 Pts p/GM, a PPG that would put them 16th on the table right now. Goals are also dangerously close to modern era lows as well (1.15 goals per game in last 20, record low was May of last year... 0.95). Looking at this year's table compared to last year I see that the Crew have one more win out of the first 11 games (four) than in 2011. The also have one more loss, though (4). I suppose what I'm getting at is this: I hope this win against Seattle get's the proverbial monkey off the Crew's back. The Crew have just been in a funk since the 6-2 thrashing last year. Crew defend very well. Justin Meram puts in his 3rd in 3 games (great Dilly Duka cross in). Crew do more solid defending. 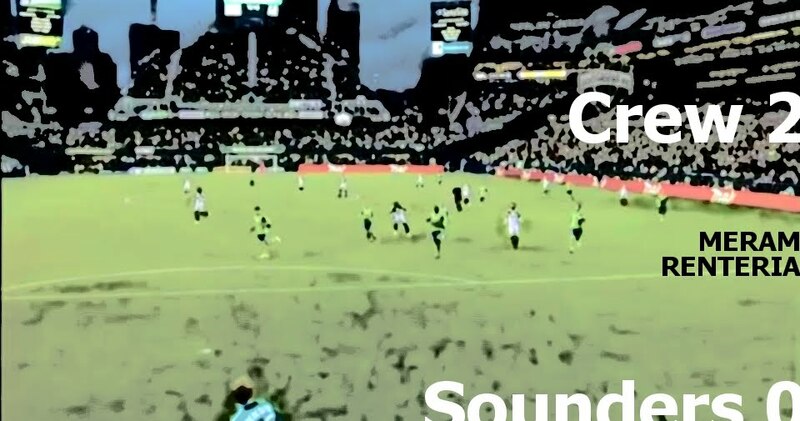 Seattle play is disjointed and disrupted by a Crew team in good positional shape. Crew defend well. Emilio Renteria has a moment of clarity and scores. Seattle gets frustrated. True colors show.